Carcassonne is a fortified city in South France close to the Pyrenees. Around 100BC the Romans started to fortify the hilltop. 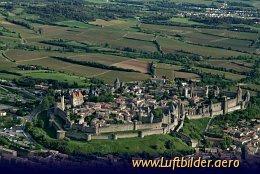 The fortress became famous during the Albigensian Crusades, when the city was a stronghold of the Cathars. The medieval fortress of Carcassonne became UNESCO world heritage in 1997.